Somali pirate attacks are plunging — thanks, in part, to a group of heavily armed ex-Navy SEALs putting their skills to use in the private sector. In the first six months of 2012, pirate attacks plummeted 33 percent, according to the International Maritime Bureau. 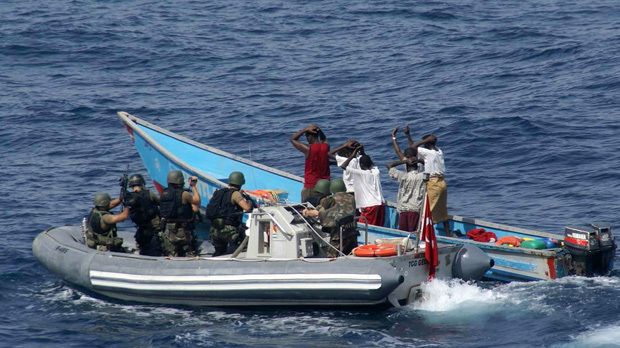 Through June, Somali pirates made 69 attacks, resulting in 212 captured hostages. That was down from 163 attacks in the same six-month period in 2011. Piracy hit its highest point last year, with attacks on 544 ships from the Red Sea to the Indian Ocean. One of the biggest factors spurring the drop is the use of maritime security companies that specialize in anti-piracy. “The fact of the matter is, if you didn’t have private armed guards, it would definitely be much more dangerous — the drop would not have been so significant,” said Michael Frodl, chairman of C-Level Maritime Risks, a consulting company. For $50,000 per voyage, shipping companies can hire a team of four ex-Navy SEALs to accompany their vessel on a 10-day voyage through the most dangerous waters in the world — the Gulf of Aden, Straits of Malacca and northern Indian Ocean — to thwart hijackings and hostage-taking. The private company Typhon is preparing to operate alongside the world’s navies, offering protection to cargo vessels sailing around the Horn of Africa. But unlike other private security firms which put guards on board other people’s ships, it will offer vessels of its own. The chief executive of Typhon, Anthony Sharpe, says the plan is to rendezvous with cargo ships which sign up for their protection and form them into a convoy. The company says it will establish what it is describing as an exclusion zone of one kilometre around the ships. The company is buying three boats, which are currently being fitted out in Singapore. Each of its craft will have up to 40 security officers, drawn from former British Royal Marines, as well as a crew of 20. The ships will be fitted with machine guns and the staff will have rifles. But Mr Sharpe told the BBC it is not a question of out-gunning the pirates. “It’s not about lethal force matching lethal force,” he said. COPENHAGEN, Denmark (AP) – Danish shipper A.P. Moller-Maersk says armed guards have thwarted a pirate attack on one of its U.S.-flagged cargo ships in the Gulf of Oman. The Copenhagen-headquartered company says “multiple pirate skiffs” headed toward the 488-feet (148-meter) long Maersk Texas on Wednesday, despite receiving “clear warning signals” from guards onboard. The pirates opened fire on the ship, and guards returned fire, eventually forcing the pirates to abandon their attack. No one was injured in the incident and the ship continued on its voyage to the U.S. No other details were immediately available Thursday. Somali pirates have been increasing their range, but attacks around the vital oil lanes near the Strait of Hormuz remain relatively rare. On Tuesday afternoon, in the small inland Somali town of Adado, law enforcement officials gazed skyward as a single-engine aircraft circled close overhead. The plane—a U.K.-owned KingAir 200 operated by the British company Phoenix Aviation and reportedly chartered by the British private security firm Salama Fikira—dropped a sack containing an estimated $800,000 to $1 million in cash. 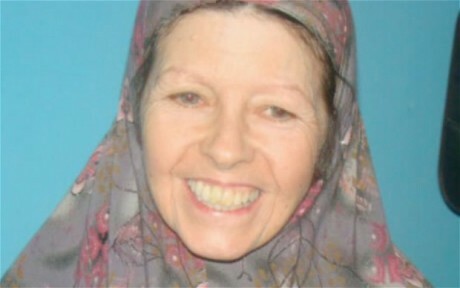 The stash was ransom for 56-year-old Judith Tebbutt, a British citizen held hostage for nearly seven months by Somali pirates. Adado has been a hotbed of hostage rescues this year: Navy SEALs staged a dramatic operation to recover American Jessica Buchanan from the town in January. Tebbutt had been in the pirates’ possession since September 11 of last year, when a Somali gang kidnapped her from an upscale resort in a remote region of Kenya near Somalia’s lawless border. During the abduction, the pirates shot and killed her husband, David; then slipped into a boat and glided north into the country that even locals call “the Land of Death”. Tebbutt’s initial captors, a dozen or so fishermen and former hotel employees in the area, are thought to be originally from the Bajuni islands in Kenya, and are purported to have connections with the radical Somali terror group Al-Shabab. They sold Tebbutt to a second band of pirates based in Haradhere, on the northern Somali coast. The group that received the ransom this week was from the Ceyr and Saleeban—two parts of the large Hawiye clan—and the gangleader is known to be a man called Bashir. African piracy a threat to U.S. security? WASHINGTON, March 19 (UPI) — Pirate attacks on merchant vessels in Africa pose a threat with ripple effects for U.S. homeland security and must be tackled as such, security industry experts say. The industry’s experts want specialist teams from commercial security firms deployed on every ship that sails in the danger zone in east Africa, where most recent piracy incidents have taken place. 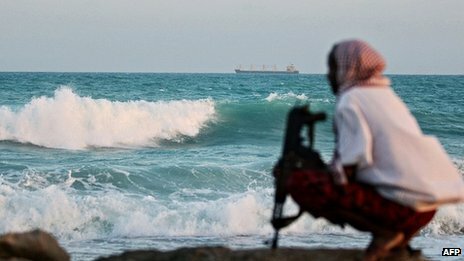 “Success at sea by the early Somali pirates has attracted major organized-crime syndicates, Muslim extremists and a more robust and sophisticated confederacy of operatives,” Jim Jorrie, chief executive officer of ESPADA marine services argued in the March 2012 issue of Homeland Security Today magazine. A boom in recruitment by security firms guarding ships against Somali pirates has caused a stream of troops to leave elite units for lucrative contracts in the private sector. The loss of veterans of wars in Afghanistan and Iraq, particularly corporals and sergeants, “rips the skeleton” from the bodies of units like the Royal Marines and Parachute Regiment, the commander of 3 Commando during the Falklands War, Julian Thompson, has warned. 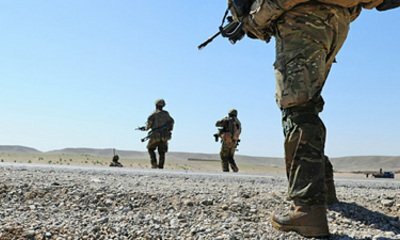 According to Ministry of Defence figures, 570 Royal Marines and 170 members of 2nd and 3rd Battalions of the Parachute Regiment left the forces between 2009 and 2011. Even though the figure for the Marines includes those who were medically discharged, the rate at which elite soldiers from both units have been leaving is around double the average. Among the Marines, the MoD admitted, the bulk of those leaving voluntarily were senior privates, corporals and sergeants. These non-commissioned officers lead sections of around eight men, or platoons of around 30. They are responsible for life-and-death tactical decisions during fighting. No definite data is available on what soldiers do when they leave the services but senior officers have been deeply concerned about the losses of experienced troops to the private security companies for more than a year. “Anecdotally, between 1st June 2011 and 30th November 2011, 54 soldiers from 3 Para have applied for Premature Voluntary Release. Of these, 24 have claimed they were seeking work in the private security industry,” an MoD source said. Manilla, Philippines—The Philippines has given Manila-flagged merchant vessels the go-ahead to deploy private security groups to minimize the risk Filipino seafarers face from Somali pirates in the Gulf of Aden and the Indian Ocean, according to the Department of Foreign Affairs. The move, however, is “subject to Philippine shipping companies” adherence to strict guidelines promulgated by the Maritime Industry Authority and the International Maritime Organization,” the DFA said Monday. “In their participation at meetings to combat piracy in the IMO, the United Nations and other fora, Philippine government officials have been advocating the importance of promoting the safety of Filipino seamen. This advocacy is being supported by other governments,” it also said. A total of 26 Filipino seamen on board three foreign-flagged vessels are still being held by pirates in east Africa. “The longest one in detention is a crew member of the MV Iceberg 1, which was hijacked by pirates on Jan. 29, 2010 off the Port of Aden in Yemen,” the DFA disclosed. Between 2006 and 2011, a total of 769 sailors from the Philippines were seized by pirates operating in the Gulf of Aden and the Indian Ocean. It is believed that all but the 26 were released unharmed and upon payment by their principals of ransom. Earlier this month, the DFA said the government had come up with a plan to protect Filipino sailors from Somali pirates. Gunmen kidnapped an American man in the northern Somali town of Galkayo on Saturday, officials said. The gunmen surrounded the man’s car shortly after the man left the airport, said policeman Abdi Hassan Nur, who witnessed the incident. He said they then forced the American into another vehicle. Galkayo is on the border between the semi-autonomous northern region of Puntland and a region known as Galmudug. It is ruled by forces friendly to the U.N.-backed Somali government. A minister from the Galmudug administration said the kidnapped man is an American engineer who came to Somalia to carry out an evaluation for building a deep water port in the town of Hobyo. The gunmen severely beat the foreigner’s Somali companion when he begged them not to take the man, said the minister. A staff member at the Embassy Hotel, where the man was staying, said the American had gone to the airport to drop off an Indian colleague. The hotel said that the man had both American and German citizenship. The staff member asked not to be identified because he was not supposed to give out information about guests. U.S. Navy Seals free American and Dane hostages from pirates in Somalia after being kidnapped in October. An American and a Dane were rescued by U.S. helicopters after being held hostage by pirates in Somalia. The two hostages were working for the Danish Demining Group (DDG), a refugee council, and were kidnapped in October in the semi-autonomous Galmudug region. American Jessica Buchanan and Dane Poul Hagen Thisted were rescued in a rare raid into the Horn of African nation by the helicopters in an attempt to free foreign captives. 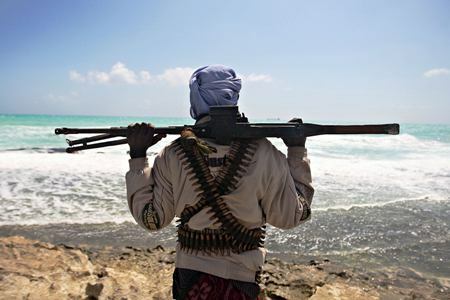 Nine pirates were killed and five captured during the rescue operation according to Galmadug’s president, Mohamed Ahmed Alim who added that he was negotiating to secure the release of an American journalist kidnapped on Saturday. Alim said attacks on pirate bases were very rare and thanked the U.S. for their intervention because pirates were considered the mafia in the region. The report by the foreign affairs committee acknowledged that the government was right to allow the use of armed guards on boats subject to certain conditions but it expressed concerns about what the accompanying guidelines omitted, saying the rules need to be tightened. It pointed out that there are more than sixty firms offering armed maritime protection for the region and said the government “should not offload responsibility onto ship owners to deal with the most difficult aspects of handling private armed guards”. It said “the guidance on the use of force, particularly lethal force, is very limited” and that the government must not leave guidance on the use of potentially lethal force “to private companies to agree upon”. An ex-Royal Marine found dead on a paradise island where he was working with private security teams fighting pirates – may have been stabbed and beaten to death, it emerged today. 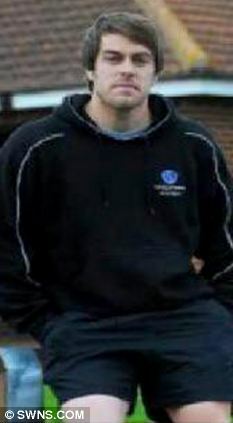 Initial post-mortem results suggested Carl Davies, 33, died after he accidentally tripped and fell 30ft down a ravine on Reunion Island, in the Indian Ocean. But a second investigation revealed the former teacher, from Kent, was stabbed ‘numerous’ times and beaten about the head with a bat. Carl’s credit card, money and mobile phone were found on his body when he was discovered. He had served in Iraq and Northern Ireland but was working as a private contractor in the Indian Ocean protecting merchant ships from Somali pirates when he died. Police have confirmed Carl was unarmed when he was found, and they believe he did not carry weapons on the island. The ship Carl was protecting, the Atlantic Trader, which had been docked in the port close to the island’s capital Saint Denis, left before his body was discovered. A relative, who asked not to be named, said: ‘A new post mortem was held on Thursday and he died from multiple stab wounds and head injuries as a result of a bat. Two workers from the Danish Demining Group taken hostage in Somalia last week will only be released for a 50 million kroner ransom, Ekstra Bladet newspaper reports. The two workers, 60-year-old Dane Poul Hagen and 32-year-old American Jessica Buchanan were abducted a week last Tuesday in the Somalian town of Galkayo and have since been moved to the al-Shabaab controlled region of Galmudug. The region’s deputy police chief, Abdi Hasan Gorey, visited the pirates to begin negotiations on Sunday. “They are demanding between $9 million and $12 million,” Gorey told Ekstra Bladet.